Our guided walking tour will take you around the Old Town of Dresden. Step by step you learn more about the capital of Saxony, its former rulers – the house of Wettin and their collections e.g. in the Residential Palace. When we pass the Catholic Court Church, we get a closer look at the Semper Opera House and the famous Zwinger Palace. 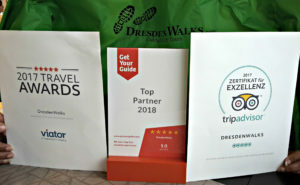 A special season for a Dresden Trip! Christmas time is one of the best seasons in Dresden! Over the years Dresden became more and more popular for it´s Old Town that transforms at Christmas time into a romantic christmas scene with more than just the famous Striezelmarkt. Feel the cozy atmosphere here while enjoying a Stollen cake and a pot of hot spiced wine. You are welcome to join us for this 2.5h ride. Let us explore the areas outside the historic city center, which you can see during our daily walking tour – maybe in combination before or after the bike ride. During the tour “Dresden by bike” our Dresden guides show you the New Town with its late 19th century style buildings, artistic designed courtyards and the special atmosphere of this part of town. You will go on to go along the Elbe River as well as visit great parks and explore the green city. Traces of Jewish settlement and Jewish life can be found in Saxony since the 11th century, and since the 14th century there have been documentary references to various Jewish communities. The Jews had to fight for centuries for their place in society. They visibly influenced and shaped the development of Saxony. The history of Jewish life in Saxony is also reflected in the collections of the Royal Palace in Dresden and can be linked and outlined with selected exhibits with exciting events and interesting personalities. DresdenWalks also offers a walking tour through the Outer New Town of Dresden which is situated on the right bank of the Elbe and which is one of the most interesting districts in the city. The Outer New Tow is famous for artists, students, pubs, bars and the apartment houses from the style of ‘Foundation Perioad’ (late 19th century). DresdenWalks offers a private walking tour of the German composer Richard Wagner. Although Wagner was not born here over 200 years ago, he had spent several years of his childhood in Dresden and returned in the mid of the 19th century to become the court conductor and so influenced the music life of Dresden decisively. We start the walking tour on Theater Square in the historical old town where the composer had celebrated one of his greatest success ever with the premiere of three of his operas at Sempers first royal theater house. Explore with us beautiful nature and rock formations! The Saxon Switzerland, south-eastern of Dresden, is one of the most spectacular mountain landscapes in Germany. It fascinates hikers, climbers, artists and tourists with its bizarre sandstone mountains in combination with the Elbe and a rich fauna and flora. Our day trip starts right in the national park of the Saxon Switzerland which is the Bastei, the most famous sight of the area. Jews have been settling in Dresden as far back as the 13th century. August the Strong used Jewish money to finance the Polish crown. In 1839/40 Gottfried Semper built the second synagogue in Dresden, which was destroyed during the Night of the Broken Glass of 1938. Witness now the new synagogue which was awarded a renowned architectural prize in 2002. The Abraham Geiger College chose this iconic temple at the site of the former Semper Synagogue to ordain the first rabbis in 2006, who were trained in Germany after the Shoah. Our Christmas tours are back!